Winnie The Pooh Movie Night! You are here: Home / Family / Winnie The Pooh Movie Night! I don’t know how he does it, but he seems to always get hungry right before the big reveal. I seriously think he is laughing to himself every time he does it. It’s Winnie The Pooh Time, And We’re Excited! I think he's ready for the show! Since the moment I saw the winnie the pooh trailer, I couldn’t wait to see it! 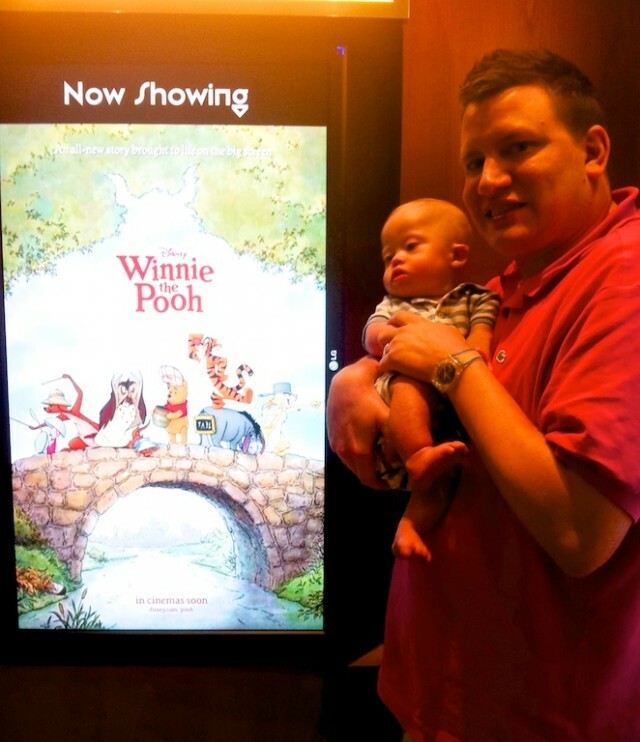 I was a huge fan of Christopher Robin and the gang growing up so as soon as we got back from our two-week road trip we took Noah to see it! We purchased our movie tickets online for a local movie theater we’d never been to before (but it was the only place showing it on a Friday night) and headed out the door. We arrived at the Highland Park Village Theatre expecting to walk into a normal sized, stadium seating, movie theater. Not so much! It turns out the entire “viewing room” we were in only had seating for 16 (two rows of eight leather chairs!) It was very small, and intimate; it felt like we were sitting in someones cozy living room. It was seriously one of the coolest movies theaters I’ve ever been to. Noah's a Winnie The Pooh Fan! After I got over the cool factor I became nervous that Noah may, in a very cute way, annoy some of the other folks. 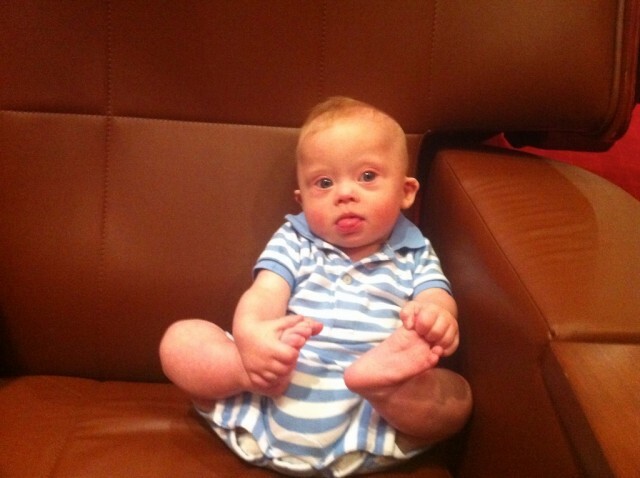 He’s in a fun stage where he likes to laugh a lot and randomly likes to make wacky mouth sounds! We think it’s super cute, but I doubt our movie going friends would think the same. To my surprise he did great! He got a little excited towards the end, and as you can see in the video, was wound up by the time the credits rolled, but he made it all the way through! Yay!!! It’s so fun to see Noah interact with the images he sees on the screen. He is certainly aware of what’s going on, and as I watched his expressions while the movie was running I saw him smile and laugh during certain parts, open his eyes really wide during some scenes, and over wall have a sense of wonder as he watched (and tried to figure out) the shapes and colors that filled the screens. This little boy is growing up. Go see Winnie the Pooh. Seriously. If you have kids, take them also. It’s great! 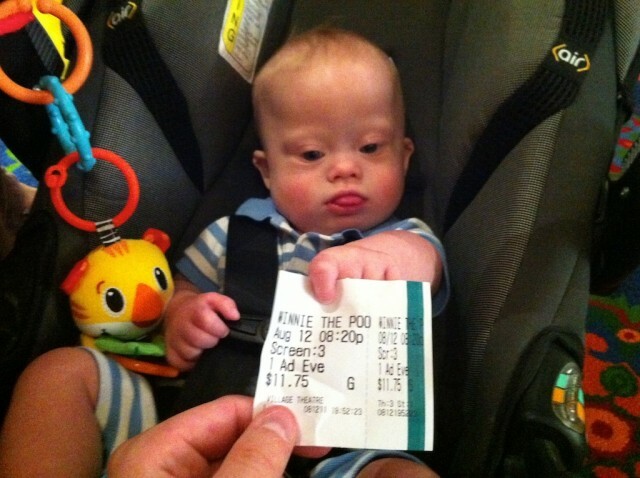 If you have kids, do you take them to the movies with you? What sorts of things do you do to keep them from distracting other people? We have three boys and our daughter. We have taken each of the boys to the movies over the years as they were growing up. I can honestly say each one of them were very easy to maintain during the movie, in fact, they usually slept through the movie. As they got older, where they were mobile of their own free will, it became a bit more involving to kept them occupied through the whole movie. That is also when we stopped taking them to movies that were of no interest to them. Kid friendly movies were the only “big screen” viewing were enjoyed for a few years during each one of the boys early years. We expect that will be the case with Tylee, so far it has been. And with Lisa’s point, I agree, there is a point where kids, need to only go to movies appropriate for their age. However, don’t leave that determination up to the MPAA, as there are several movies not appropriate based on the rating giving, even at the G rating. Be a responsible parent. Expecting a viewing of Winnie the Pooh to be free of kid distraction is a little silly. I’d be more surprised to see an adult without a kid. Also, I was surprised how many adults were there by their self with no kid. As you saw in the video, that place was sort of like a data place! I was surprised how many adults (Without kids) were in this movie by their self…ha,ha..